Trying to read and understand your wireless bill can be an extremely frustrating and blood-boiling experience, especially if you are a smartphone user. In the world of unregulated wireless providers and hidden fees, you always end up paying more than the original price of your monthly plan when you signed up. Before you fall pray to the overcharging and out-of-control cell phone companies, here are a couple of handy tips for what you should pay attention to on your monthly statement. When you rip open your monthly wireless bill, chances are you’ll notice a bunch of odd-looking charges, surtaxes and usage fees with mysterious names. So what do they actually stand for? State & Federal Taxes: This one is pretty straight-forward. Just like you pay a tax on any bill or purchase, the monthly prices advertised by your mobile provider do not include taxes. The amount to pay in state telecom taxes depends on the city, county and state you live in. Folks unlucky enough to be living in New York will be stuck paying 16% while anyone with a smartphone in Nevada pays contributes just a little bit over 1% in state telecom taxes. Regulatory Cost Recovery Charge: This charge may sound official, but it actually is neither a tax nor a government-regulated fee. Allegedly, this fee is used by cell phone companies towards recovering some of the money they spend on so-called “national regulatory fees and programs”. What they actually meant to say was that they are knowingly milking their customers to compensate for fees that Verizon, AT&T and co. pays to the federal government, including government funds to help the visually and hearing impaired. Long story short, this is a patchwork of erroneous fees that you’ll just have to put up with. Federal Universal Service Fund Fee: This is part of a government program to subsidize cell phone service for low-income families, schools, hospitals and libraries. A tiny amount of this fee also goes towards expanding telecom infrastructure to rural areas across the country. Sounds like a good cause, but again the consumer is made to bear the brunt of it. Also, many state, including Alaska and Wyoming, have universal service funds of their own which will mean another few extra dimes and nickels on your bill. 911 Service Fees: No, this is fee is not part of the post 9/11 Patriot Act and, no, it doesn’t mandate government surveillance. Actually, this is where the 911 emergency number gets some of its funding. 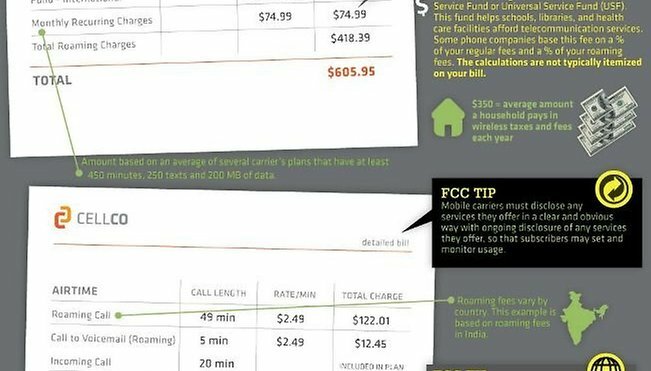 Obviously, different cell phone providers have different fees and it’s impossible to cover the whole spectrum of ludicrous charges. It is, however, important to remember that what often looks like a government fee is actually just something the cell phone companies have made up to generate extra cash. Check out this cool infographic for more tips on how to prevent your next cell phone bill heart attack.